The site’s unique churches face collapse without restoration. Paltoga. Church of the Epiphany (left)&Church of Icon of the Sign. Northwest view. Aug. 28, 2006. 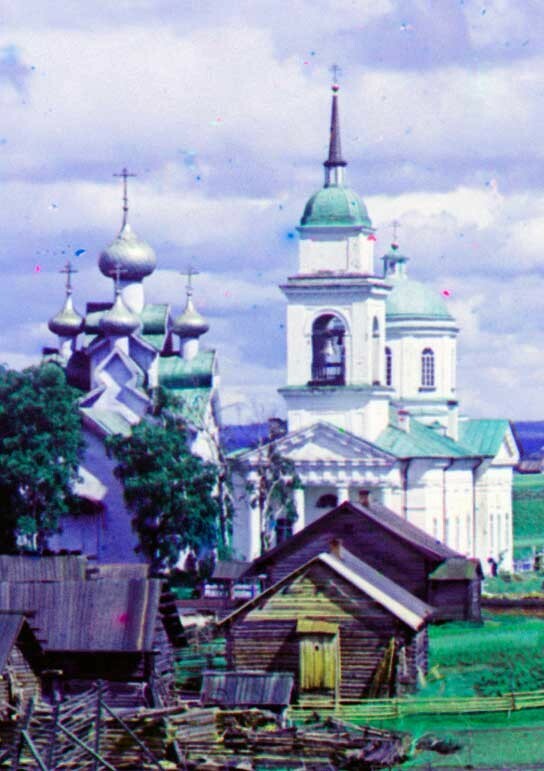 At the beginning of the 20th century the Russian chemist and photographer Sergei Prokudin-Gorsky developed a complex process for vivid color photography. His vision of photography as a form of education and enlightenment was demonstrated with special clarity through his images of architectural monuments in the historic sites throughout the Russian heartland. In 1909, Prokudin-Gorsky received a commission from the Ministry of Transportation to photograph along the Mariinsky Waterway in northwestern Russia. The state support that ensued from this decision gave an essential stimulus to the development of his documentary project. He traveled to the area in June and July of that year. Paltoga. Church of the Epiphany (left)&Church of Icon of the Sign. West view. Summer 1909. The water route chosen not only connected some of Russia’s most ancient archaeological sites, but it also illuminated important episodes in the development of St. Petersburg, founded in 1703 and designated the capital of Russia in 1712. Faced with the challenge of supplying the new capital with grain and other essential commodities from the interior of the country, Peter the Great initiated the development of a transportation network that connected St. Petersburg with the Volga River basin. This waterway was further developed during the reign of Emperor Paul (1796-1801), who named it after his consort, Empress Maria Feodorovna. The system extended from the Neva River at St. Petersburg to Lake Ladoga, then via the Svir River to the southern part of Lake Onega. Beyond Onega, the Vytegra River and canal led via the Kovzha River to White Lake (Beloe Ozero). That lake is drained by the Sheksna River, which ended at the important grain port of Rybinsk on the Volga, thus connecting St. Petersburg to the vast resources of the Volga River basin. Paltoga. Church of the Epiphany, northwest view. Aug. 28, 2006. 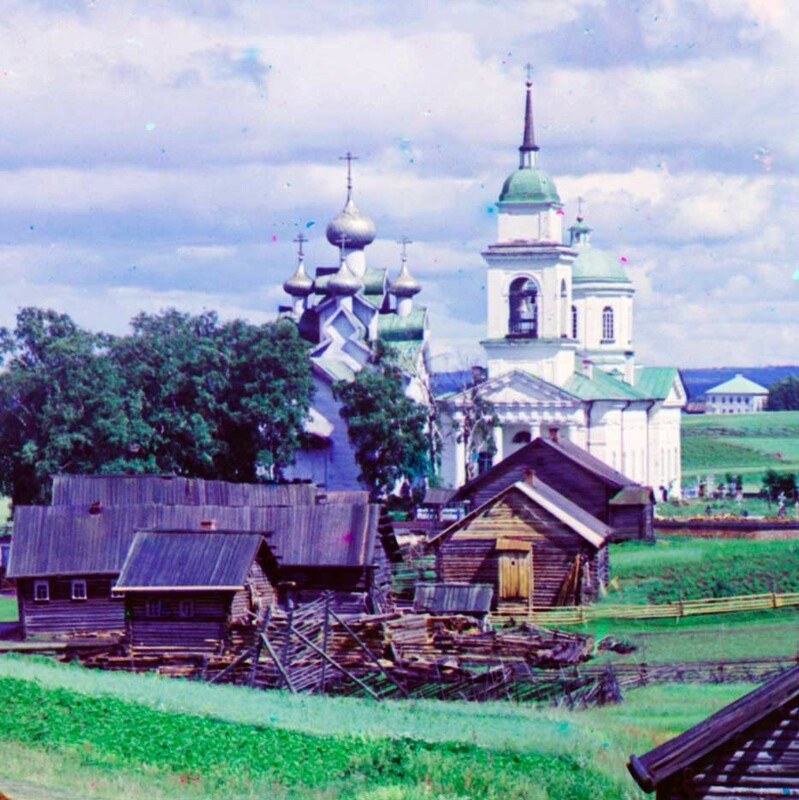 A major point on Prokudin-Gorsky’s Mariinsky itinerary was the town ofVytegra, first referred to in written documents at the end of the 15th century. Even before the development of the canal system, Vytegra had become a crossroads in the early 18th century for trade between the northern port of Arkhangelsk and the city of St. Petersburg. Church of the Epiphany, southeast view. Aug. 28, 2006. An essential component of the Mariinsky Waterway was a canal that linked the Vytegra River, which empties into Lake Onega, and the Kovzha River, which flows south into White Lake. In 1799 this segment was named the Mariinsky Canal, and the settlement of Vytegra - named after the river and officially designated a town in 1773 - became the canal’s administrative center. 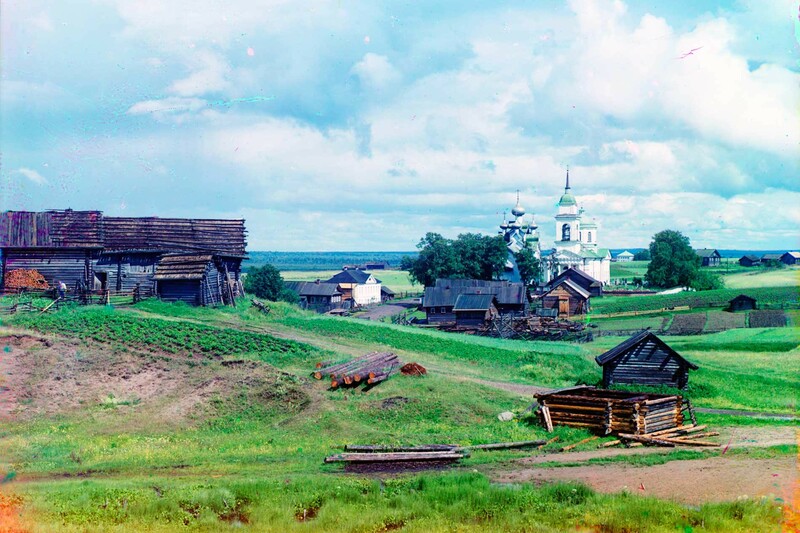 While at Vytegra, Prokudin-Gorsky photographed not only the town itself (much of which was rebuilt during the Soviet period) but also the village of Paltoga, located eight km to the west of Vytegra. 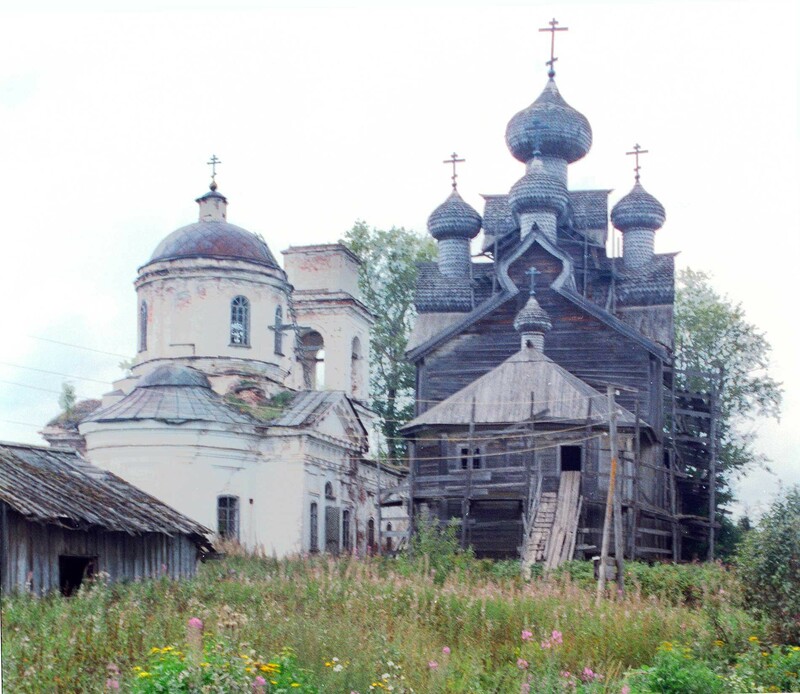 The village was referred to as a pogost, which traditionally meant that it had at least one church and a cemetery. Church of the Epiphany (left)&Church of Icon of the Sign, west view. Summer 1909. 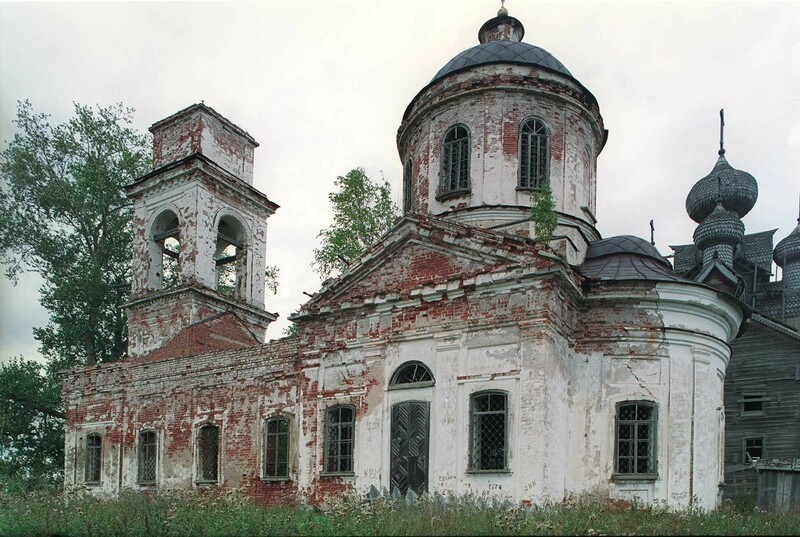 At the time of Prokudin-Gorsky’s visit, Paltoga had two churches: The wooden Church of the Epiphany, built on a rise in 1733; and the Church of the Icon of Virgin of the Sign (Znamenie), built of whitewashed brick in 1810. Both churches still stood in picturesque ruin at the time of my visit in 2006. Church of Icon of the Sign, northwest view. Aug. 28, 2006. 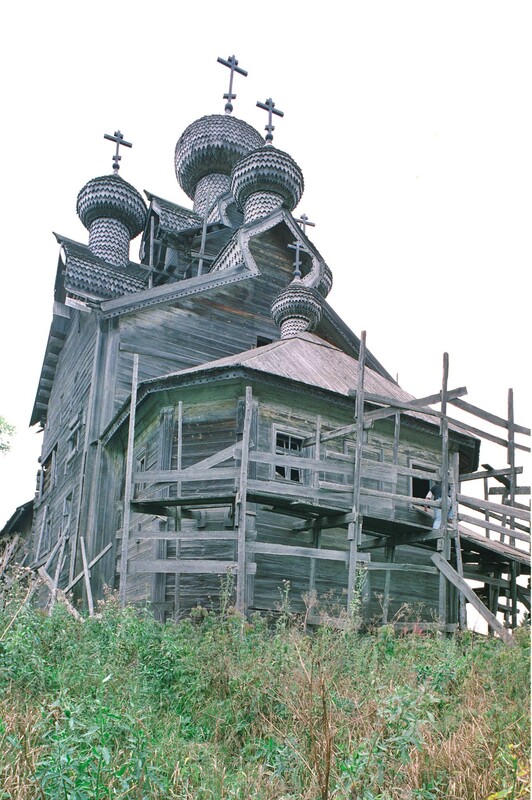 The wooden Church of the Epiphany is especially interesting as an example of northern wooden architecture. Its basic structure is a cube crowned with a much smaller cube that serves as a core for the church’s five cupolas. The largest cupola rises at the center of the crown, while the other four cupolas rest on “barrel” gables that extend on the four points of the compass. The crown is just visible above the trees in Prokudin-Gorsky’s distant view from the west. Although not common, this distinctive arrangement is seen in a few other northern churches built at the turn of the 18th century. On the west side the church has a long vestibule. Unfortunately, no matter how well built, log structures will eventually collapse if not repaired and maintained. An instructive example is the Epiphany Church. In the 19th century the log walls were clad in plank siding, the shingle covering of the cupolas were replaced with sheet metal, and the windows and other details were modified. Church of Icon of the Sign, south view. Aug. 28, 2006. 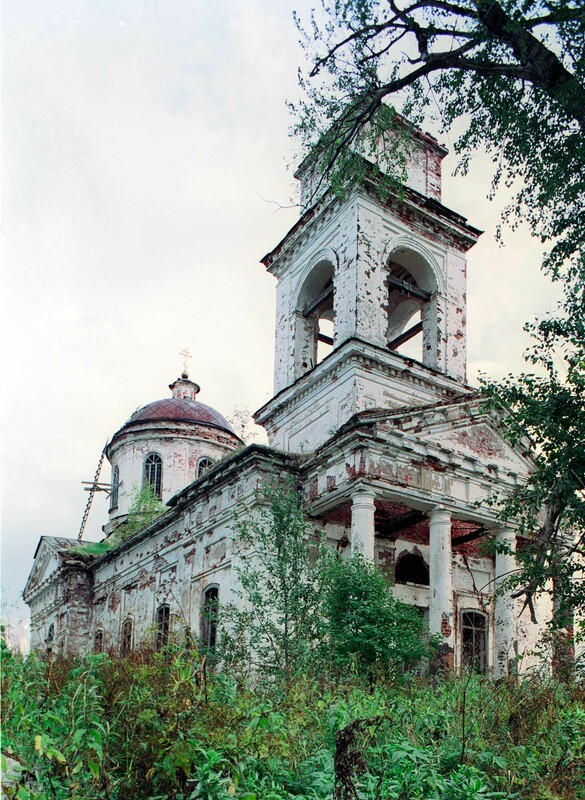 During the early Soviet period, the church was closed and deprived of four of its five cupolas. An effort to restore the structure began in the 1990s, and the cupolas were rebuilt with the recreation of shingle covering. But, as often happens, the restoration was abandoned in mid-course. Church of Icon of the Sign. Interior, view north with dome. Aug. 28, 2006. 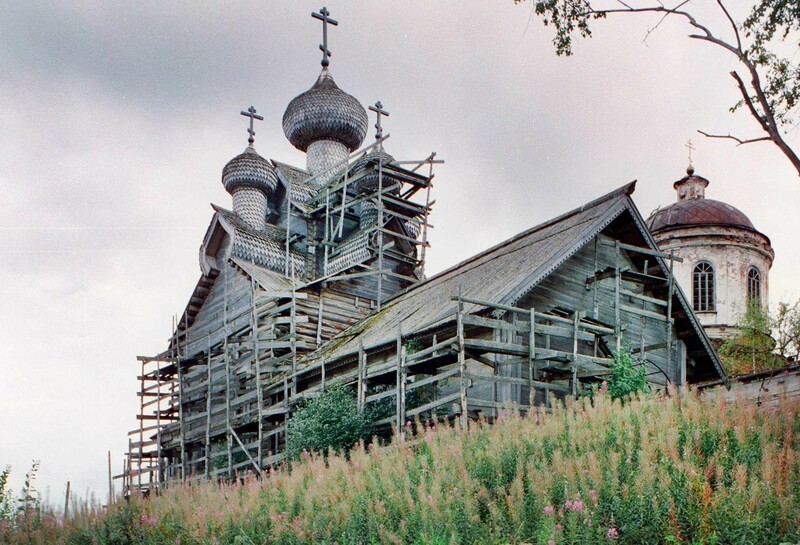 By 2006, when I was there with cameras, the church was already in a state of extreme disrepair with rotting scaffolding. In 2009, the structure collapsed. Efforts were made to conserve what is left of the lower log courses, and by summer 2015, the remains were completely disassembled in preparation for a rebuilding. However, much of the original structure was lost in the collapse, and the prospects for a completed reconstruction remain uncertain. Adjacent to the Epiphany Church is the Znamensky Church (Icon of the Virgin of the Sign), built in a simplified but appealing neoclassical style. The main structure supports a rotunda and dome, with a semicircular apse (containing the altar) on the east end. A one-story vestibule extending to the west is faced with an elegant Doric portico, above which is a tiered bell tower. Church of Icon of the Sign (left) & Church of the Epiphany. East view. Aug. 28, 2006. 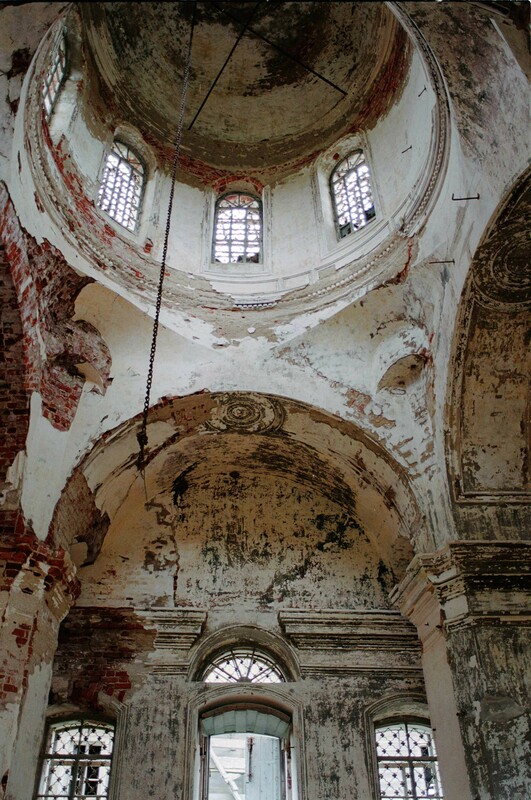 Like its neighbor, the Znamensky Church was closed and ransacked during the Soviet period. Exposed to the elements over the decades and overgrown with weeds, the roof and walls have degraded with threatening cracks in the structure. My photographs of the interior project a sort of lyrical desolation, Although the solidly built structure will probably stand for the foreseeable future, its future is uncertain, particularly without a viable parish. The degradation continues with this lovely example of provincial Neoclassicism. 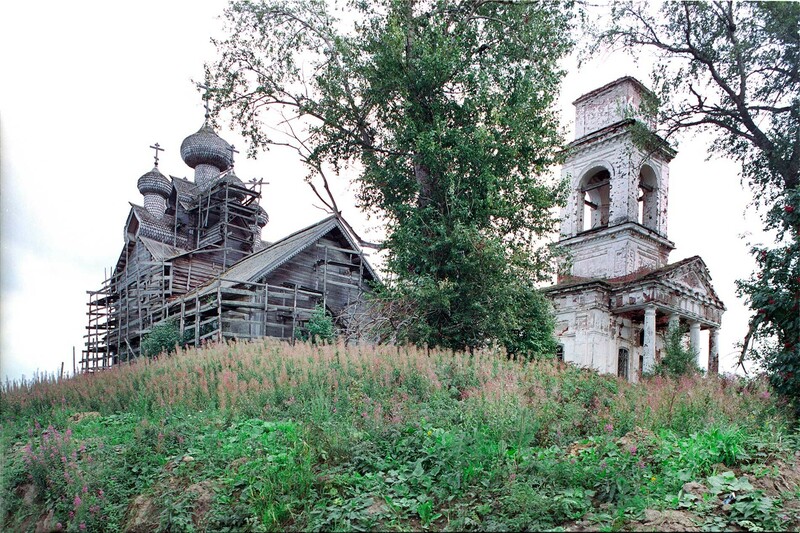 Paltoga village, with Church of the Epiphany (left)&Church of Icon of the Sign. West view. Summer 1909.